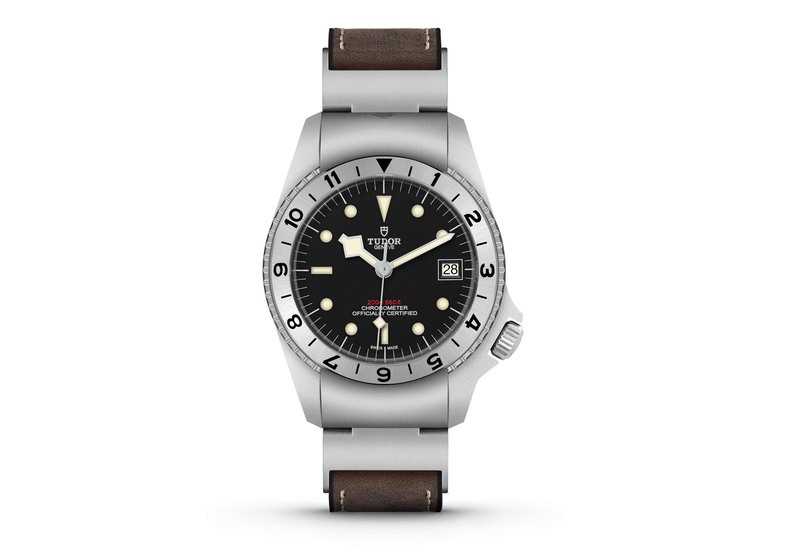 Tudor’s latest Black Bay is something of an oddity that draws inspiration from a little-known prototype built for the US navy in 1967. Now in Tudor’s archives, the historical watch had a winding crown at four o’clock and a patented, hinged end-link for locking the 12-hour bezel. 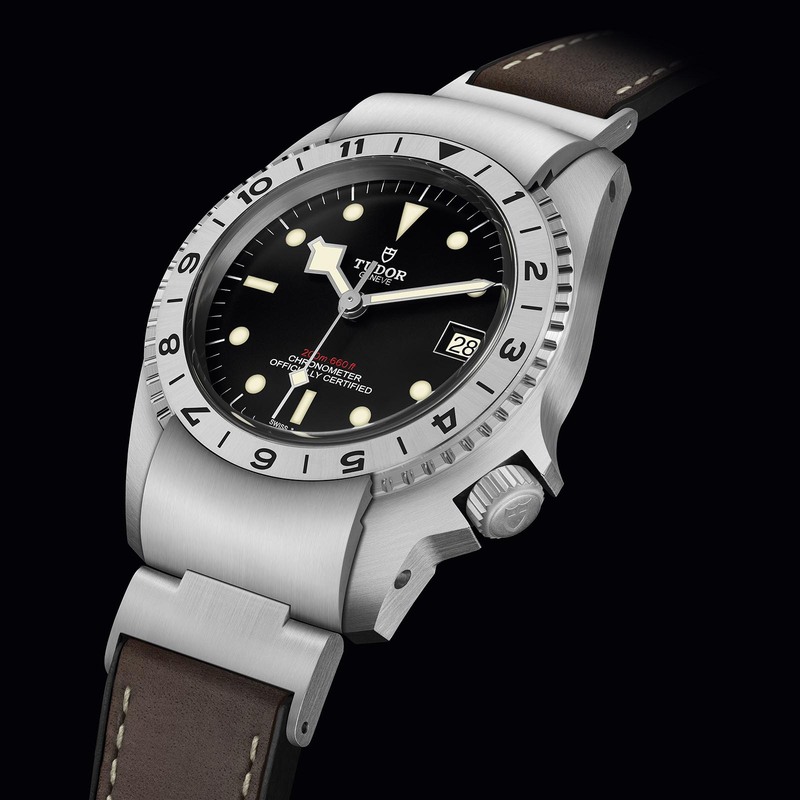 It was conceived in response to a US navy tender – Tudor was already a supplier to the navy then – but never came to fruition as the American navy turned to another watchmaker. Measuring 42mm in diameter, the Black Bay P01 has a steel case that is entirely brushed on all surfaces and rated to 200m. Though it is the same shape as the original, the P01 is larger by some margin, with the original being only 40mm. 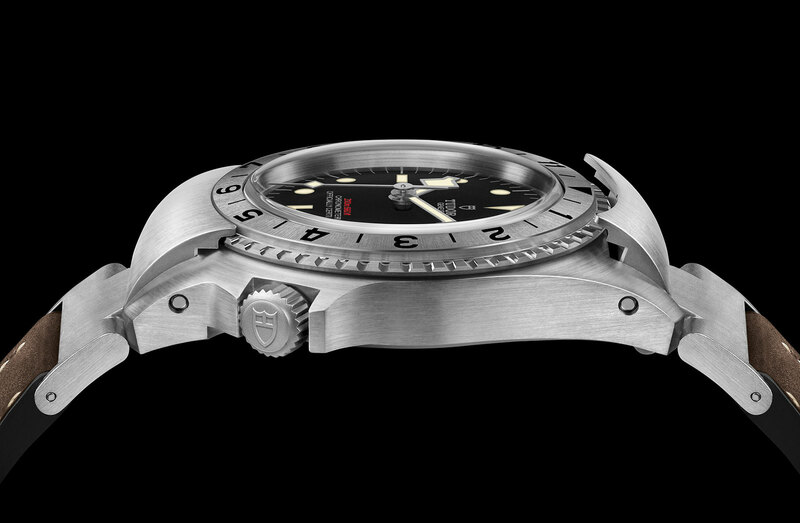 Amongst the peculiarities it borrows the prototype is the distinctive, four o’clock crown placement, and the patented system bezel locking mechanism. 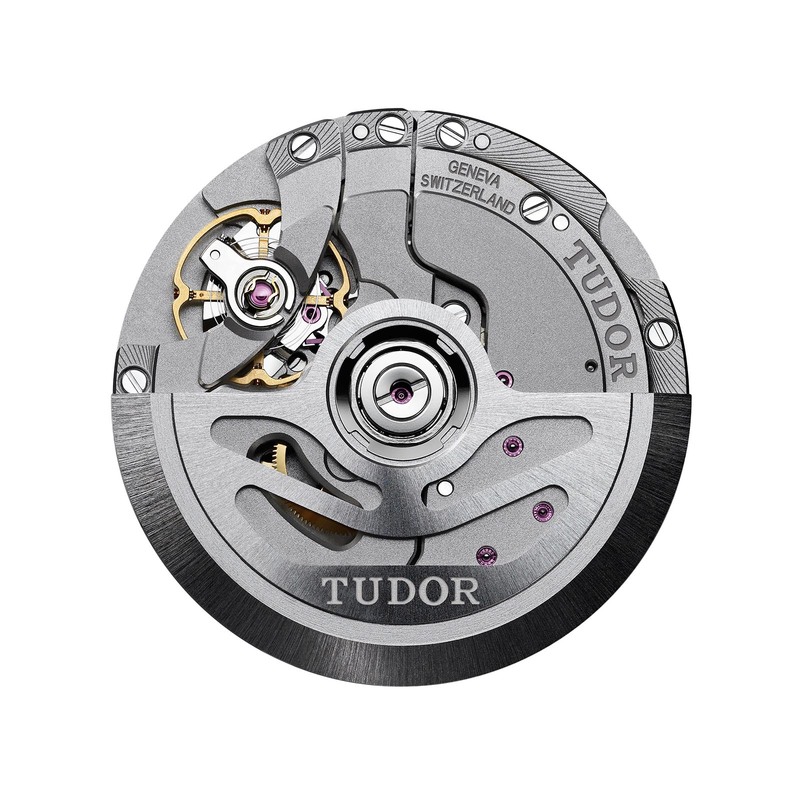 Though the bezel locking mechanism appears similar to the original, it is mechanically different according to Tudor. 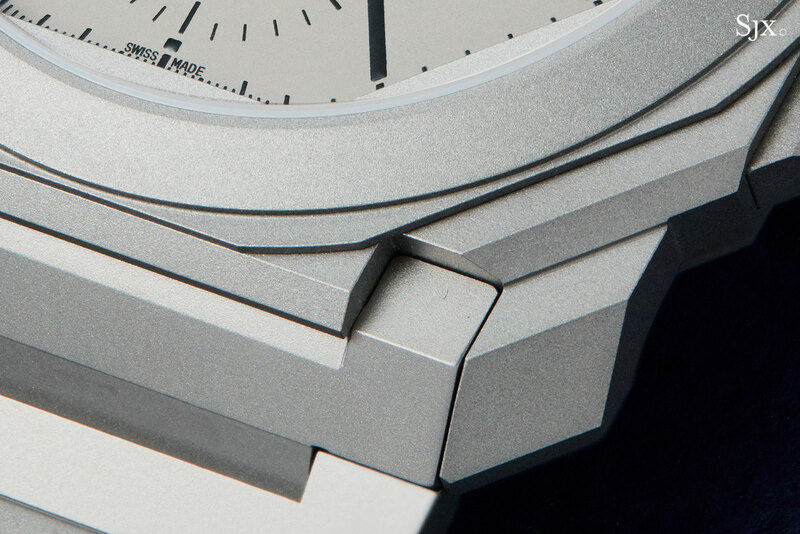 While the original featured detachable end-links on both sides that could be opened to rotate the bezel or removed the bezel completely, the P01 has only a single pivoted end-link at 12 o’clock. And the bezel on the Black Bay P01 is fixed. 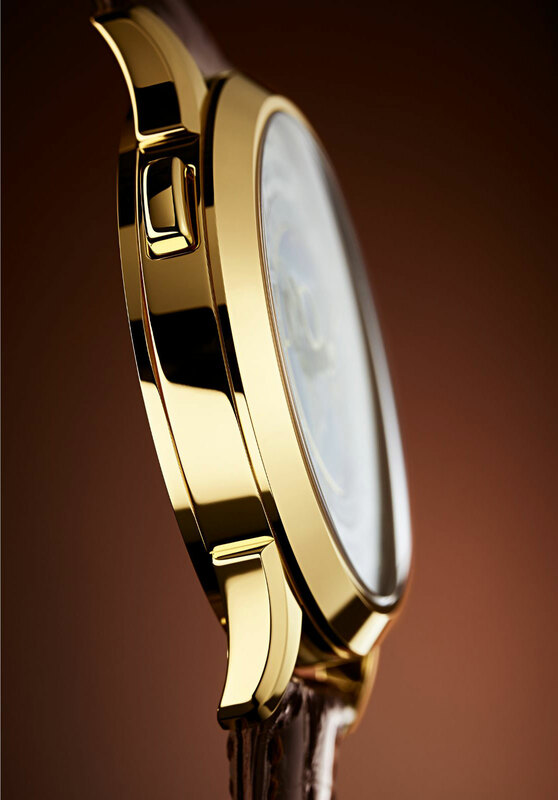 The P01 is fitted with a domed crystal meant to evoke the domed acrylic crystal on the original. The watch is powered by the in-house cal. MT5612. Like all Tudor movements, it’s self-winding with a three-day power reserve, silicon hairspring, and a free-sprung, adjustable mass balance wheel. 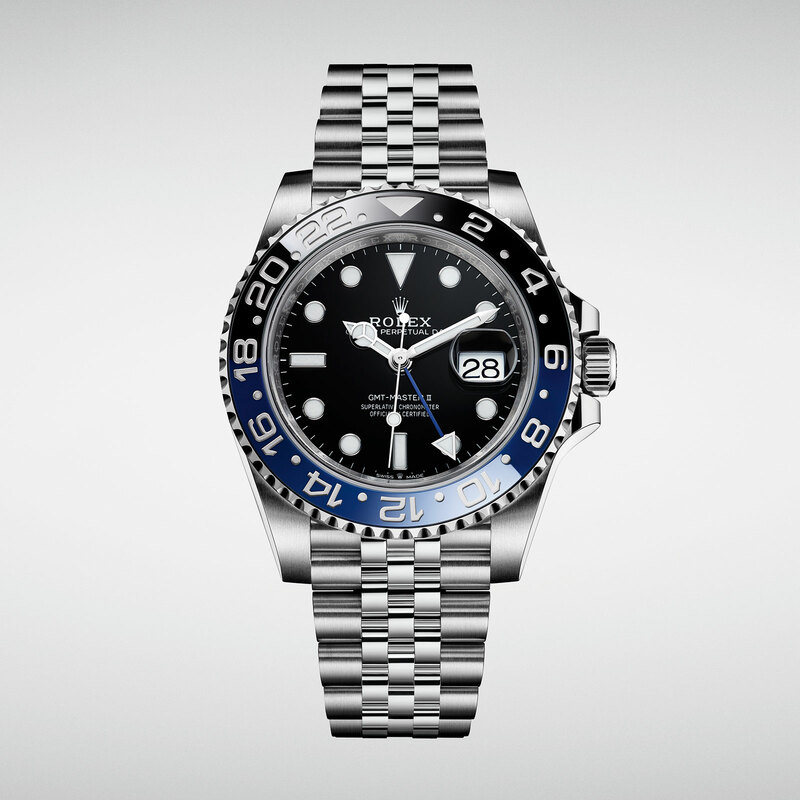 The Tudor Black Bay P01 (ref. 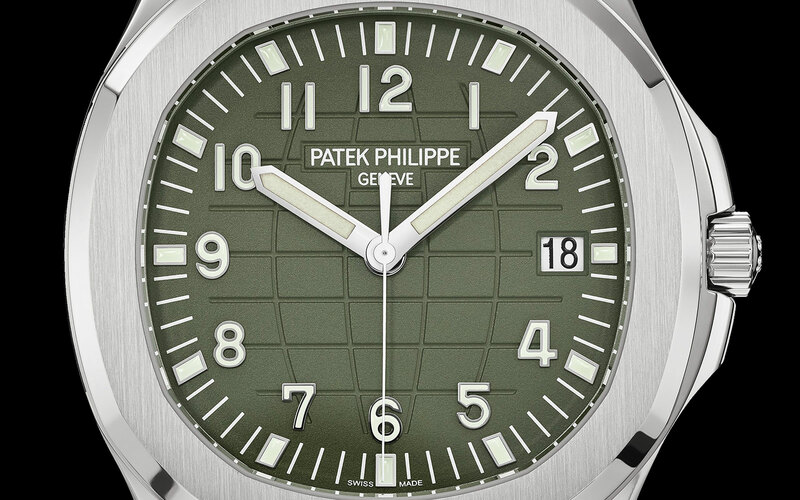 70150) is priced at 3,750 Swiss francs, and will be available from July 2019. With the updated cal. 3285 movement. 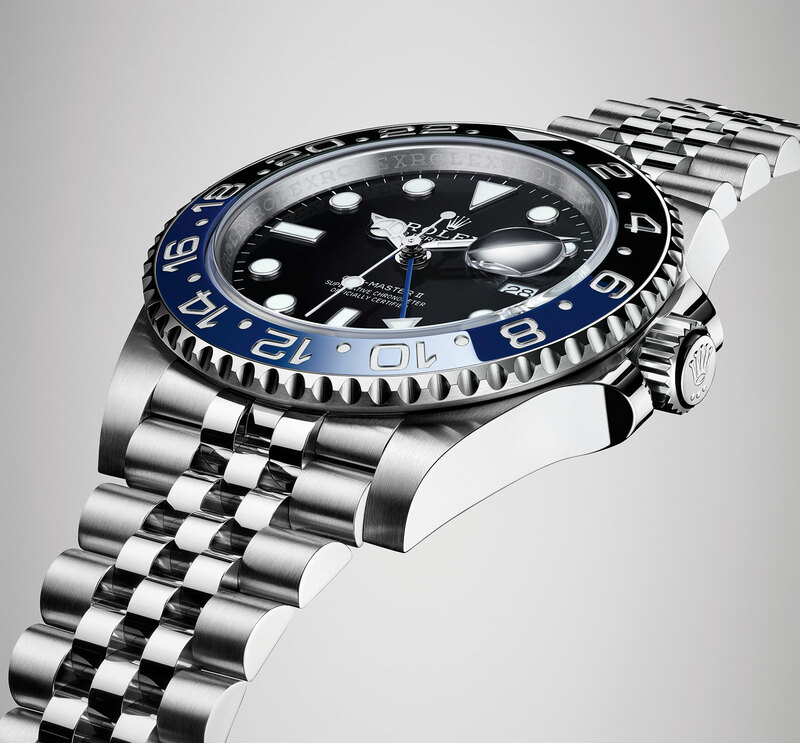 When Rolex took the covers off the GMT-Master II “Pepsi” on a Jubilee bracelet last year, the reaction was overwhelmingly positive, and the model now enjoys a waitlist many, many months long. 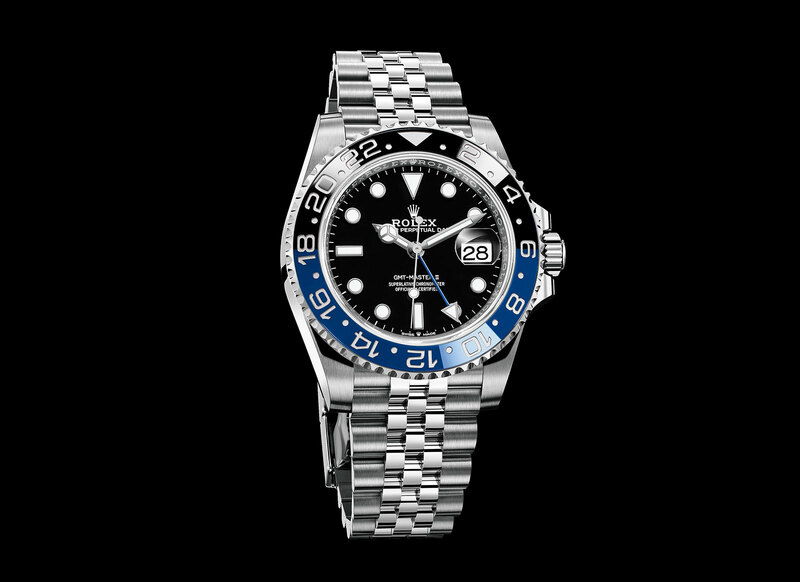 This year, Rolex has applied the same treatment to the GMT-Master II “Batman”, keeping its signature blue and black bezel, while giving it a Jubilee bracelet, redesigned lugs, and a cal. 3285 movement. 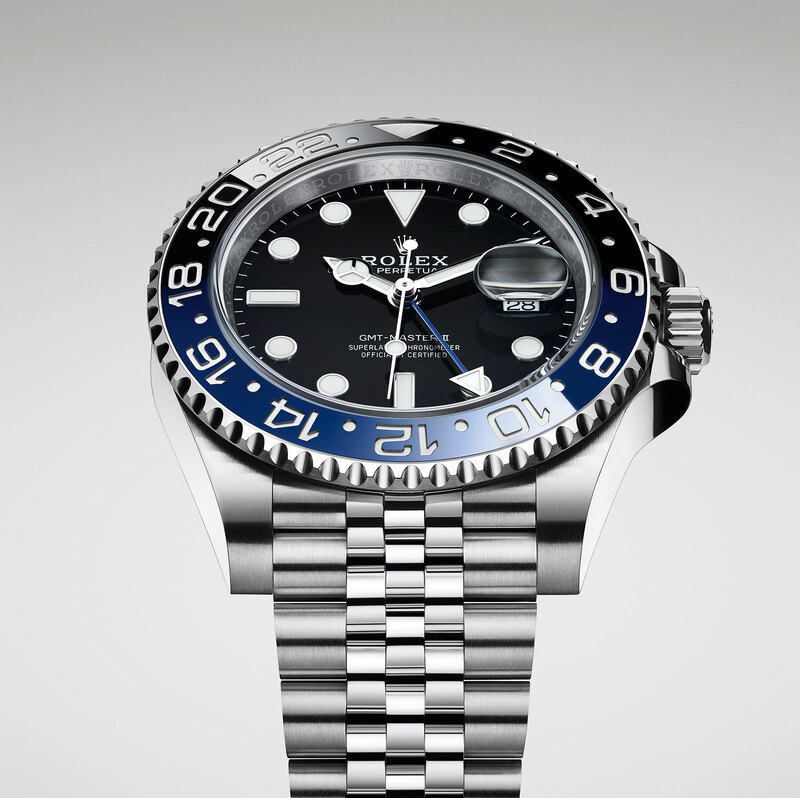 Most significantly, the facelift means there is now a clearly defined visual distinction between the steel GMT-Master IIs, which both have Jubilee bracelets, and the various gold or two-tone models on Oyster bracelets. Being essentially the same watch as last year’s GMT-Master II “Pepsi”, save for the colours, the new “Batman” has the same feel. The Jubilee bracelet feels much softer than an Oyster bracelet, while bestowing a slightly retro style on an obviously modern watch. 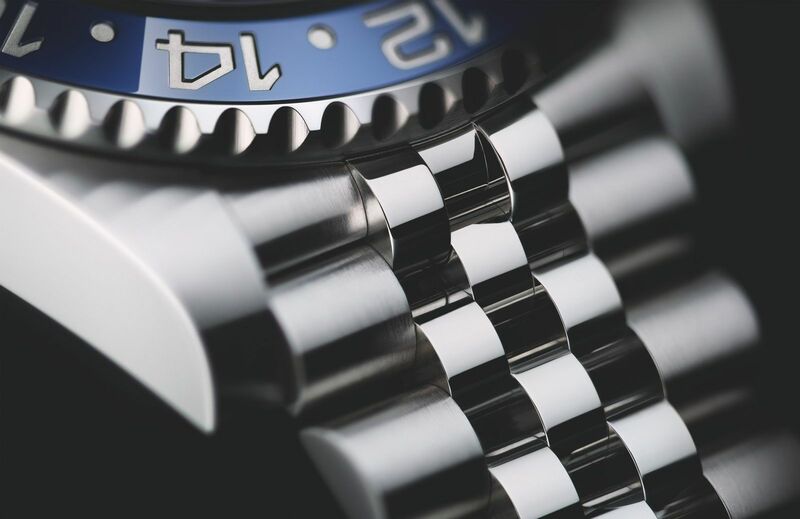 The five-link Jubilee bracelet means that the lugs have also been tweaked to accommodate the new bracelet, with the lug holes being drilled in a different position, as compared to the cases with Oyster bracelets. And while the dial design is identical, there is a subtle difference: a coronet sits at six o’clock, in between “Swiss” and “made”, signifying that this GMT-Master II is powered by a calibre from the latest generation of movements, the cal. 3285. Like the other movements of its range, the cal. 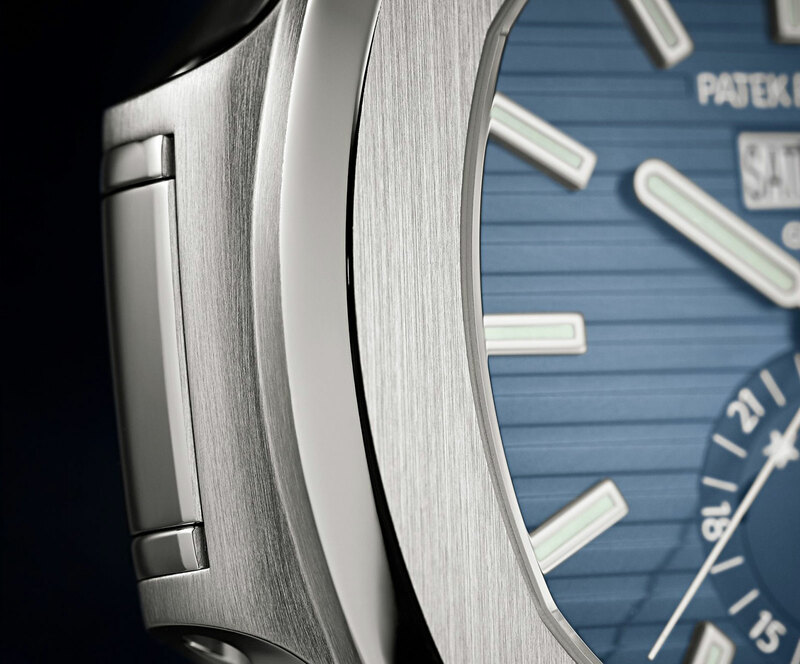 3285 boasts the Chronergy escapement, blue Parachrom hairspring, and a power reserve of 70 hours. 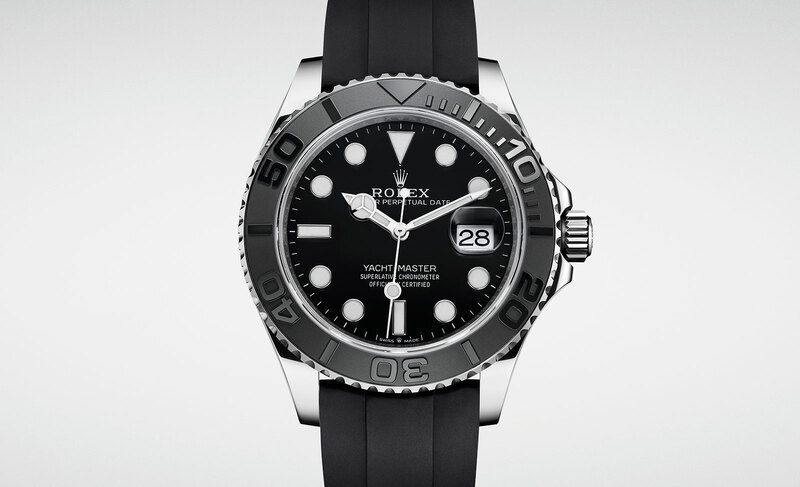 The new GMT-Master II (ref. 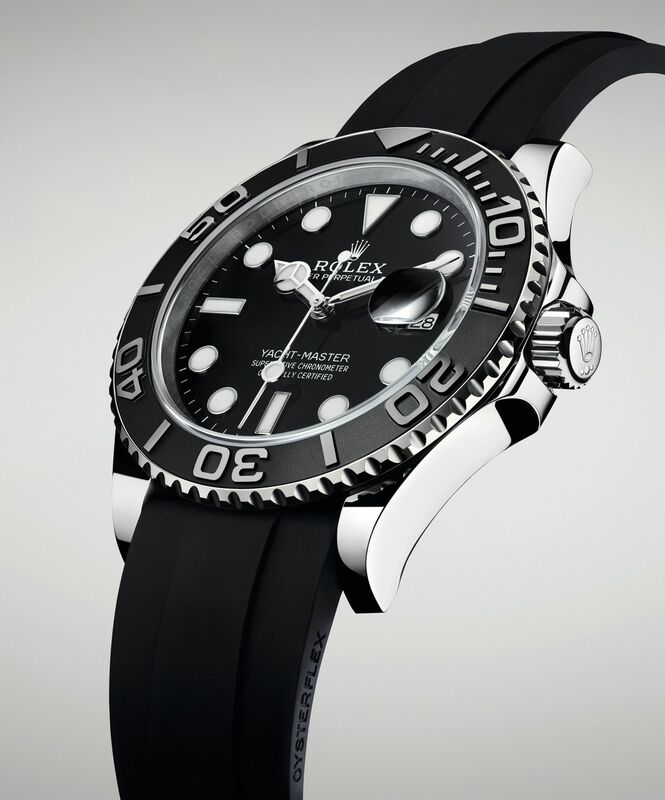 126710BLNR) is priced at 8,800 Swiss francs, or 12,430 Singapore dollars. Incremental improvements to a solid product, making it a big hit. 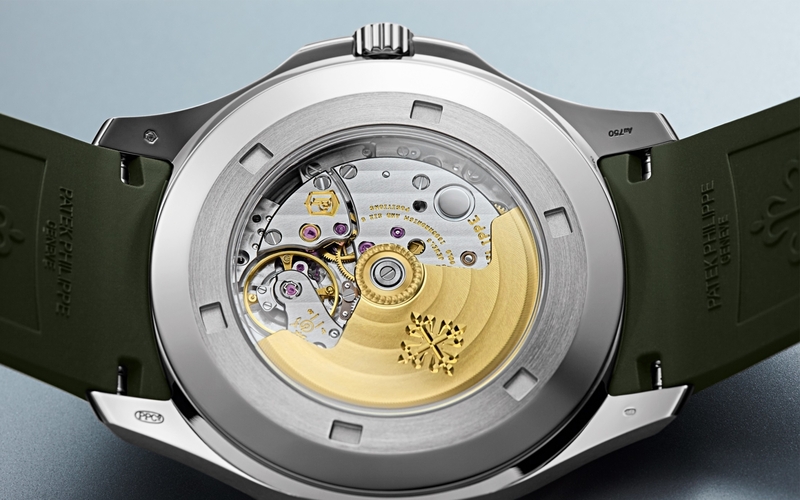 In 2014, Bulgari got started in the world of ultra-thin watches with the Octo Finissimo Tourbillon, followed by an ultra-thin minute repeater two years later. 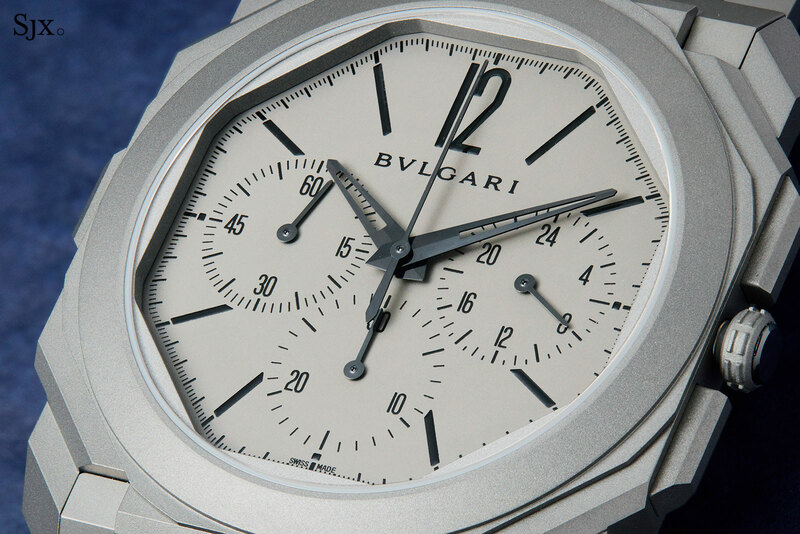 The year after, Bulgari debuted its best ultra-thin watch to date, Octo Finissimo Automatic, before going four for four with last year’s Octo Finissimo Tourbillon Automatic. 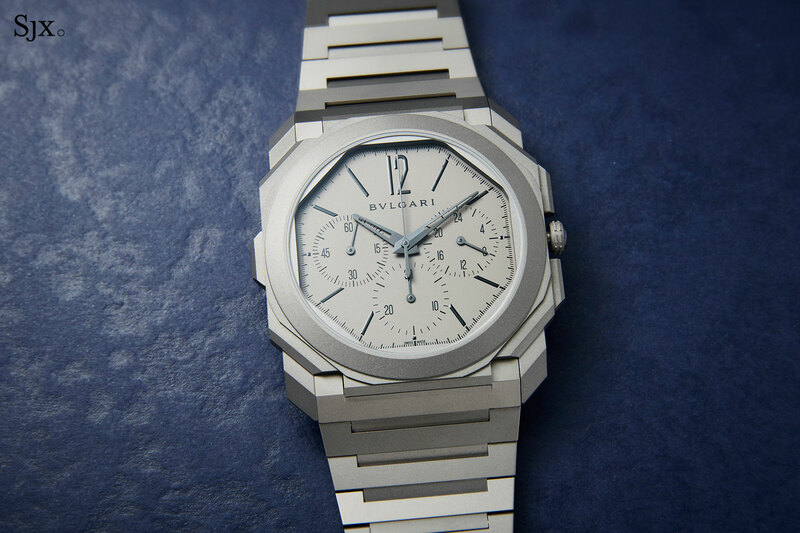 And just last night before Baselworld 2019 opened, Bulgari unveiled the fifth watch in its line-up of record-setting ultra-thin watches: the Octo Finissimo Chronograph GMT Automatic, the world’s thinnest mechanical chronograph. 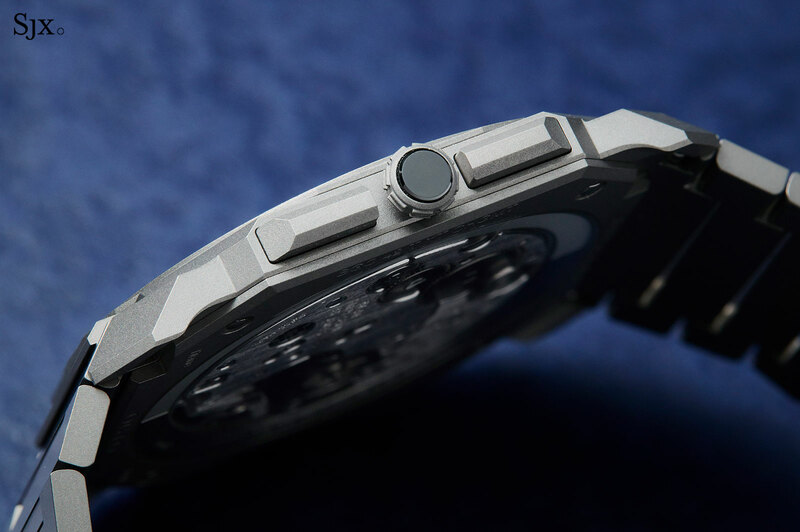 In the metal – despite there being relatively little of it – the watch is truly impressive, given the scarcity of super-slim chronographs on the market. Styled exactly like the other Octo Finissimo watches, the new chronograph has a 42mm case that’s just 6.9mm thick, making it one of the few chronographs that fit easily under the cuff, a point Bulgari chief executive Jean-Christophe Babin emphasised during the presentation. 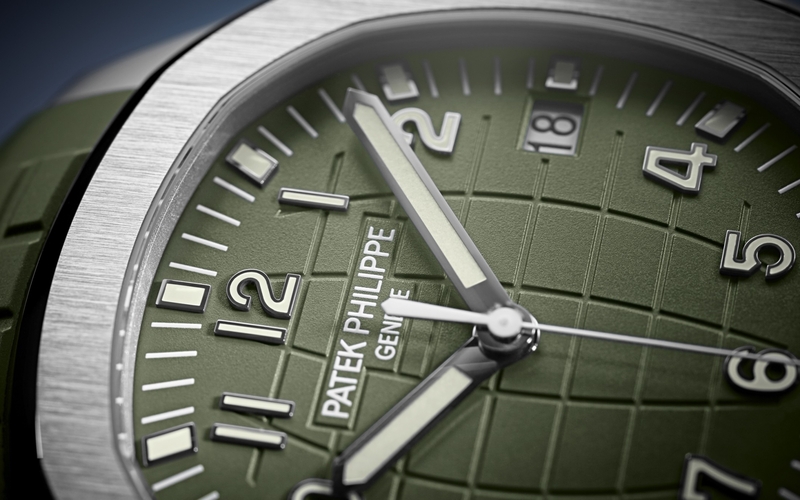 The sandblasted finish of the dial, case and bracelet make for a clean, uniform aesthetic across the entire watch. 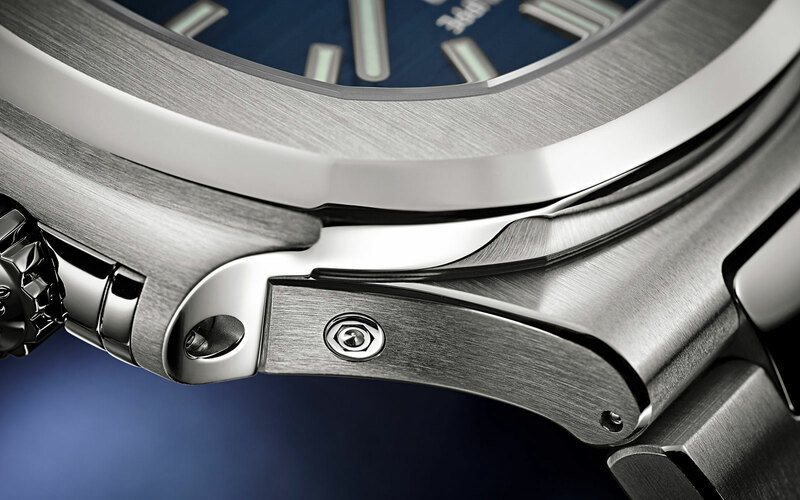 The watch is thin, lightweight and remarkably supple on the wrist, although it has a large footprint due to the diameter. Though it’s only 2mm larger than the time-only Octo Finissimo, the size is pronounced and it feels almost too big. Despite being a double complication, a chronograph with a second time zone, the dial remains straightforward and legible. Naturally it is not as minimalist like the time-only Octo Finissimo, but there is nothing superfluous on the dial. That being said, a twin counter, or “bi-compax”, layout would have been more aesthetically pleasing. All the more so since a second time zone isn’t the most obvious complement to a chronograph, and appears to have been installed to balance the dial rather than for a utilitarian purpose. 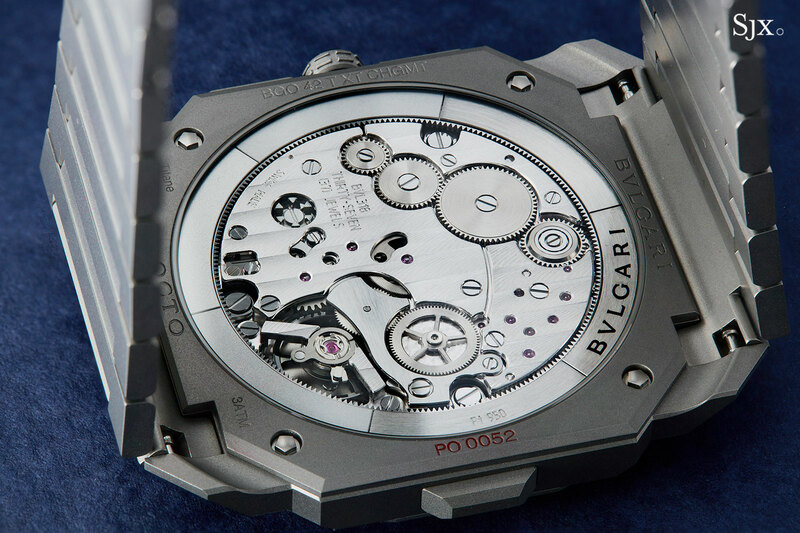 The chronograph is operated via the pushers on the right side of the case, while the local time hour hand (which is in the centre) is advanced in one-hour steps by the single pusher at nine o’clock. Home time is displayed in the sub-dial at three. 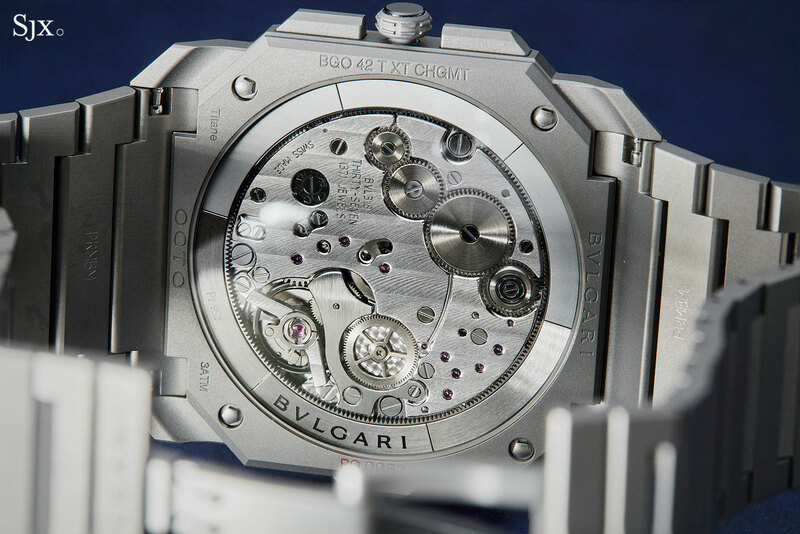 It’s powered by Bulgari’s new, in-house chronograph movement, the BVL 318 that measures a mere 3.3mm high. The movement relies on the same peripheral winding mechanism found in the BVL 288 tourbillon calibre from last year, and shares the same power reserve of 55 hours. 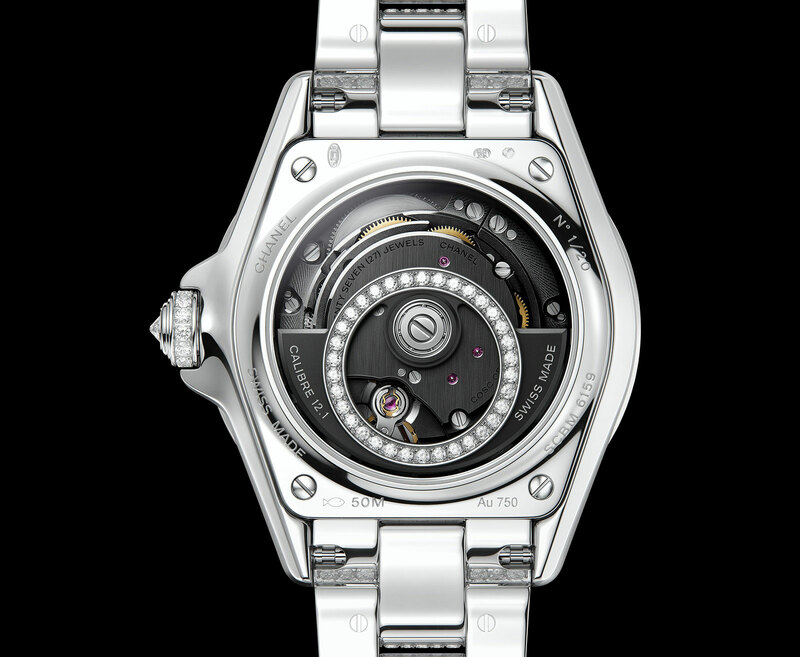 Winding is accomplished with a narrow platinum ring that sits on the outer perimeter of the watch. 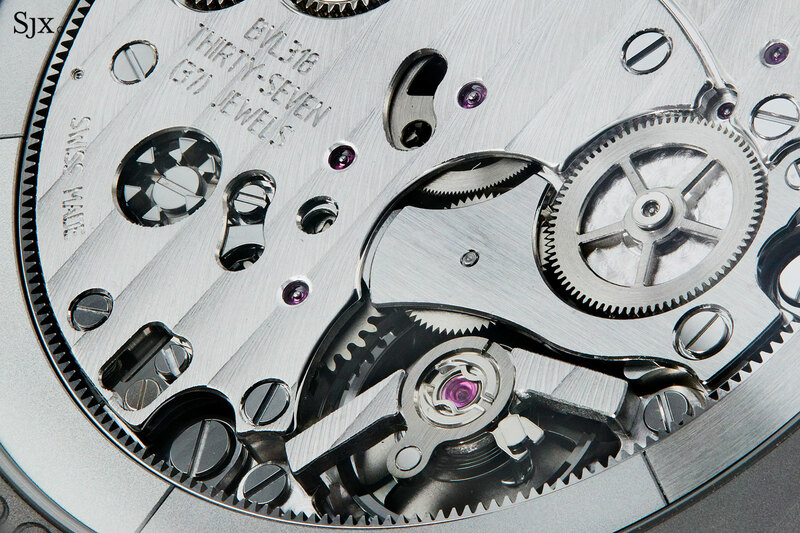 Because the height of the movement was a crucial constraints, the chronograph uses a more traditional horizontal coupling instead of the vertical clutch that is currently fashionable. Consequently, the movement is a relatively large 37.2mm wide, with everything inside laid out as flatly as possible, with minimum stacking. 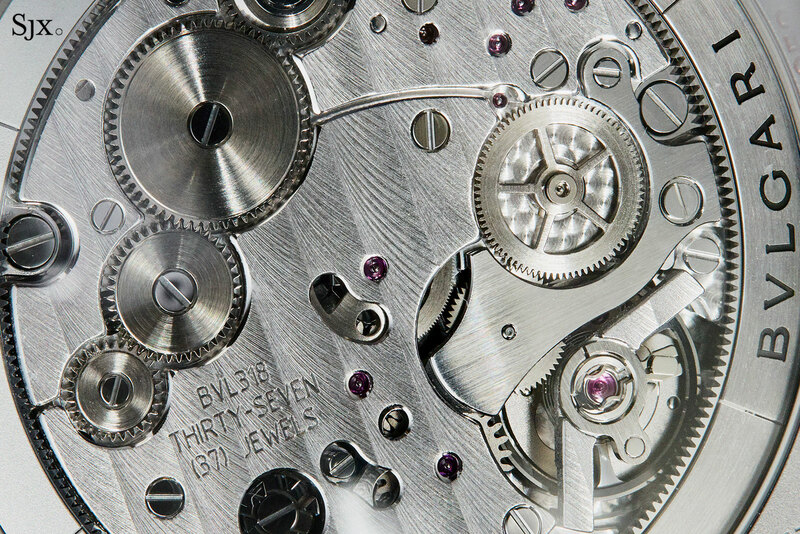 Far too often, watchmakers insist innovation comes at a cost. 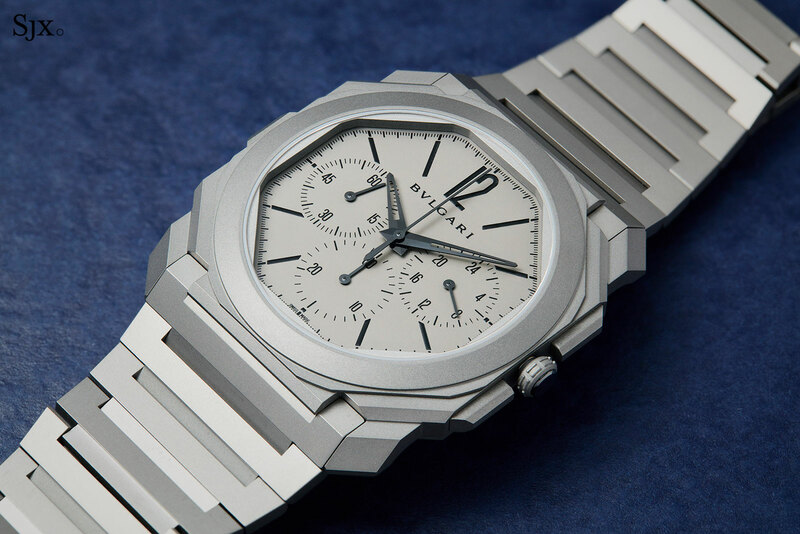 Most record-breaking, ultra-thin watches are produced in limited quantities at high prices, but Bulgari has essentially democratised such watches to an extent that the Octo Finissimo are almost the quintessential men’s Bulgari timepiece. That holds true for the Octo Finissimo Chronograph GMT Automatic, which is surprisingly accessibly priced as such things go. Retailing for just under US$18,000, the Octo Finissimo chronograph (and GMT) presents significant value that sets a new industry standard. The Octo Finissimo Chronograph GMT Automatic (ref. 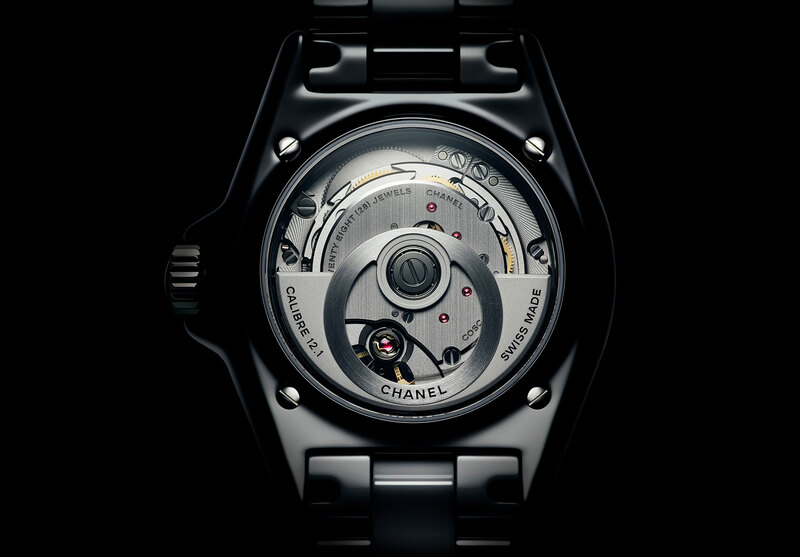 103068) will be priced at US$17,600, or 24,700 Singapore dollars. 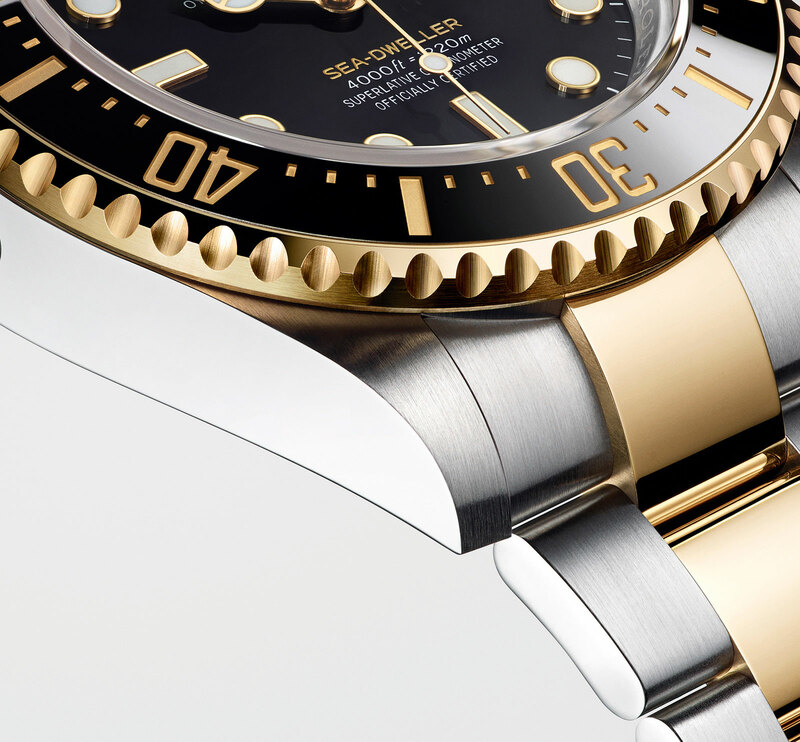 In a historical first for Rolex, its professional saturation diver’s watch is getting the two-tone steel and gold treatment – the new Sea-Dweller Rolesor is in Oystersteel with 18k yellow gold accents. 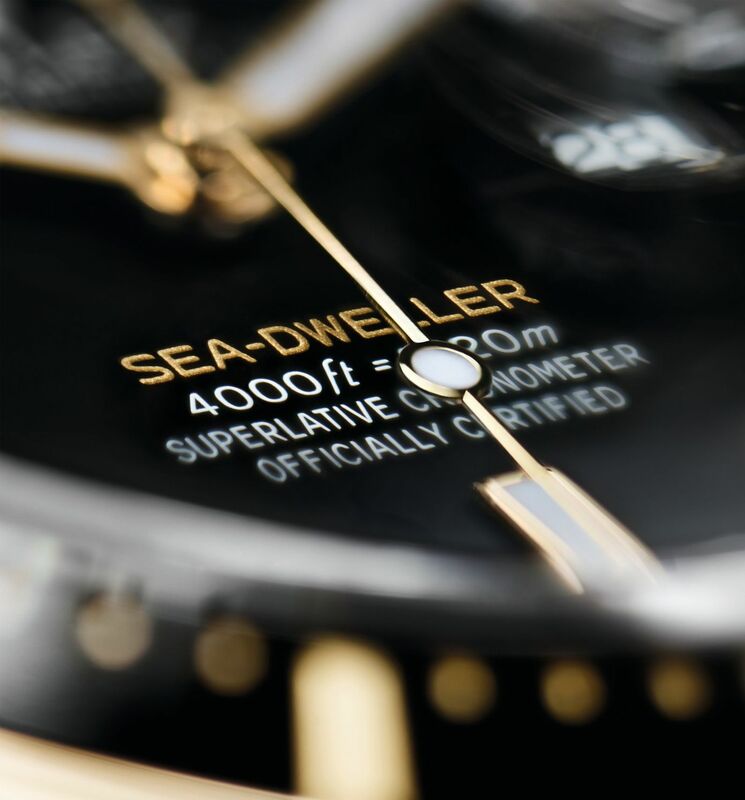 Rolex-speak for a combination of steel and gold, Rolesor gives the new Sea-Dweller a strikingly different look, but its specs remain exactly the same as on the version launched in 2017 to mark the 50th anniversary of the Sea-Dweller. 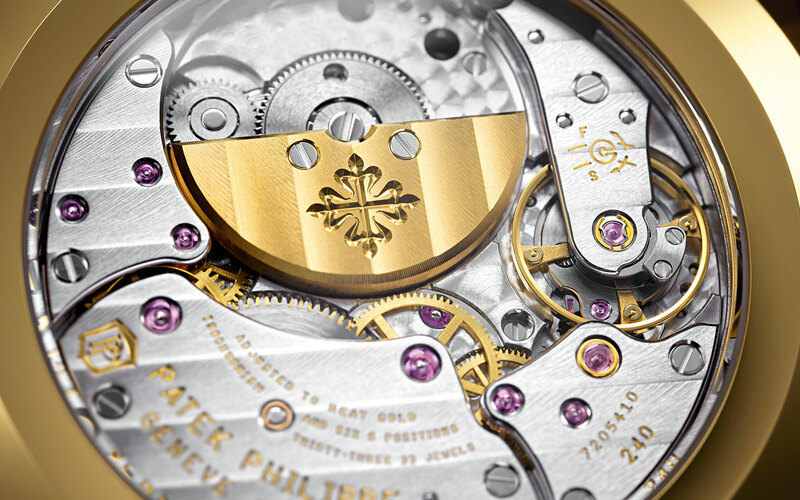 The dial is identical, except the hands and hour markers are in 18k yellow gold. 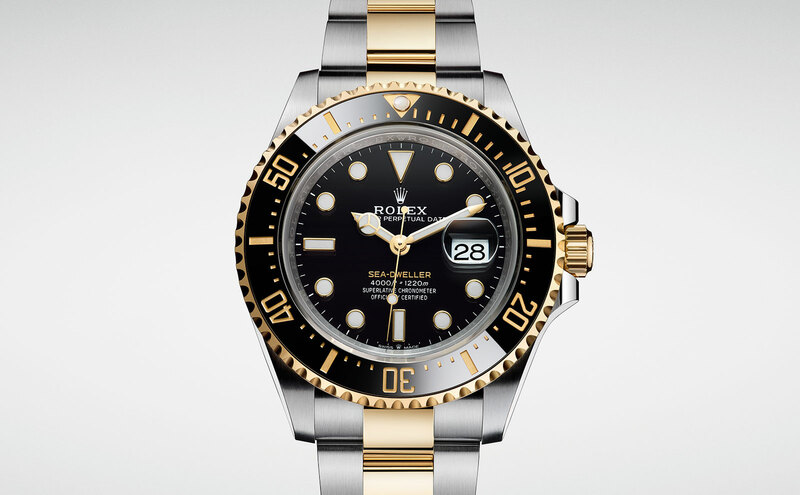 And instead of the red lettering on the 2017 model that paid tribute to the original, however, “Sea-Dweller” is now inscribed in gilt print to match the gold accents. 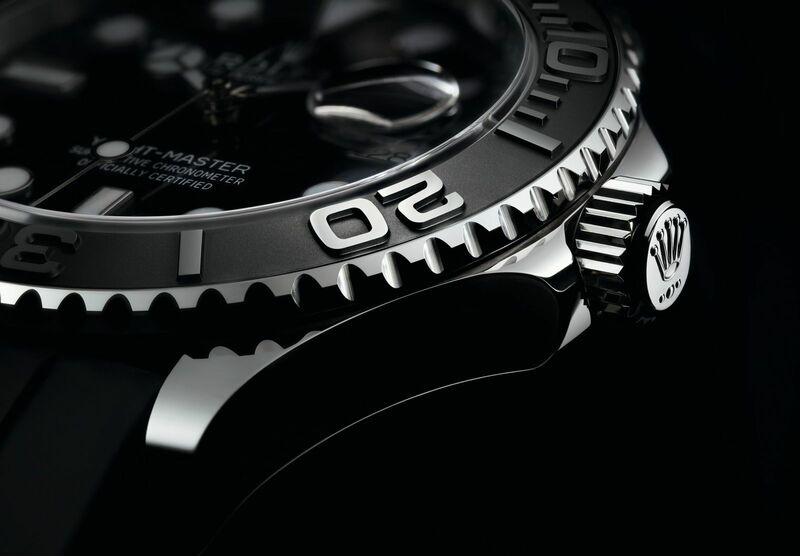 All the deep sea diving features of the Sea-Dweller, namely the helium escape valve and the depth rating of 1,220m, remain intact and unchanged. 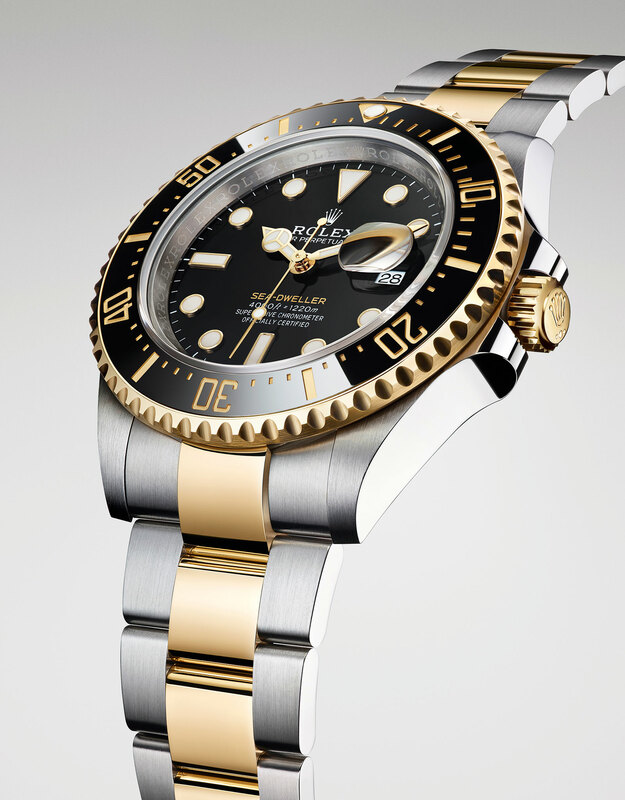 Like the all-steel Sea-Dweller, the two-tone version has a 43mm case, except with an 18k gold bezel and crown. Similarly, the bracelet remains the Oyster, but with 18k gold centre links. Powering the watch is the new generation cal. 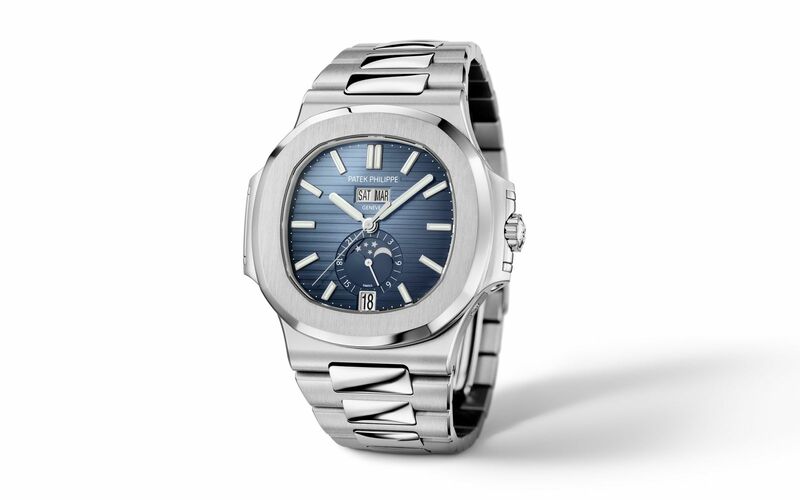 3235 with Paraflex shock absorbers and blue Parachrom hairspring, and a power reserve of 70 hours. 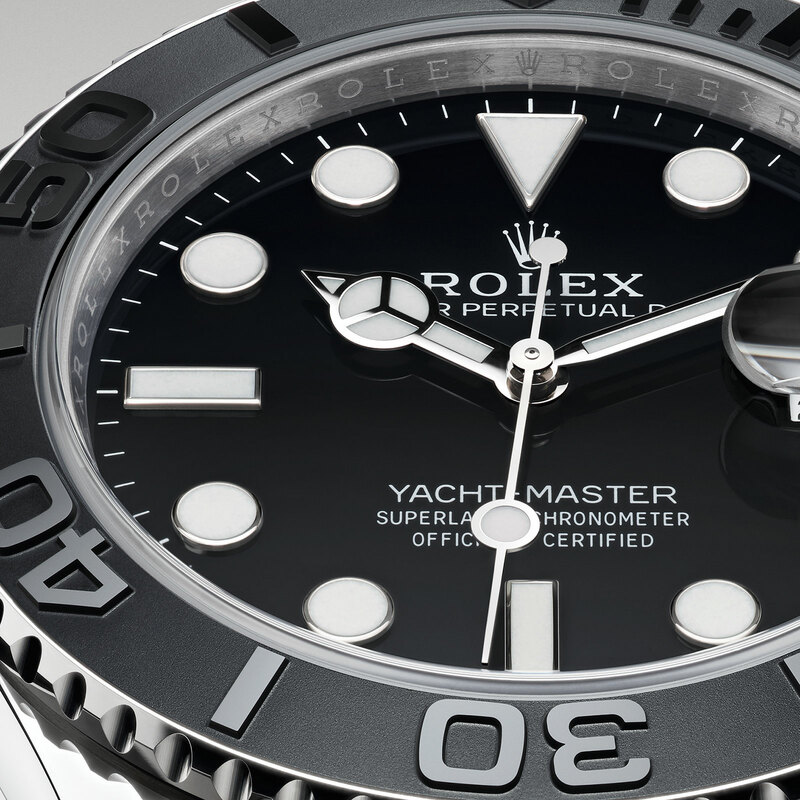 The Rolex Sea-Dweller Rolesor (ref. 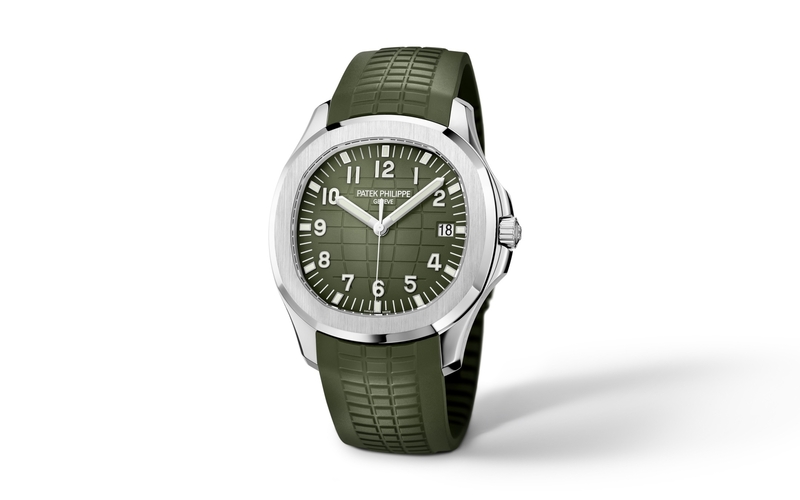 126603) is priced at 15,300 Swiss francs, or about US$15,300. 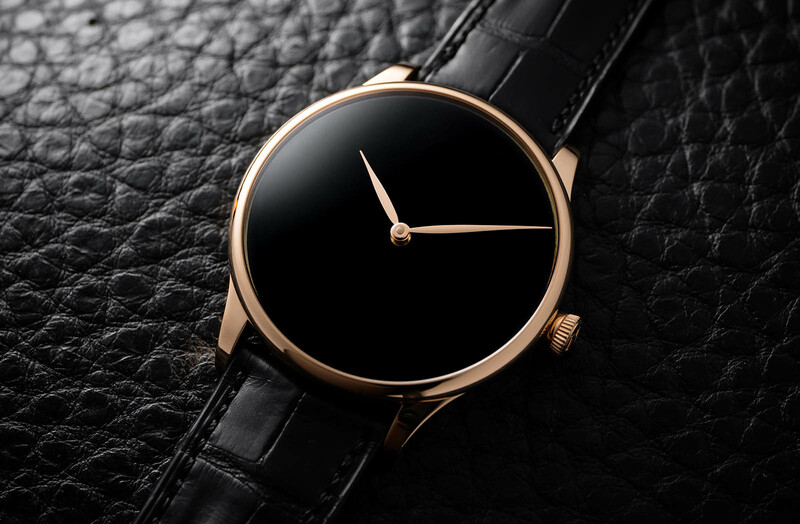 Following last year’s Endeavour Perpetual Moon Concept, H. Moser & Cie. returns to Vantablack and takes minimalism to the extreme with the Venturer Concept Vantablack. 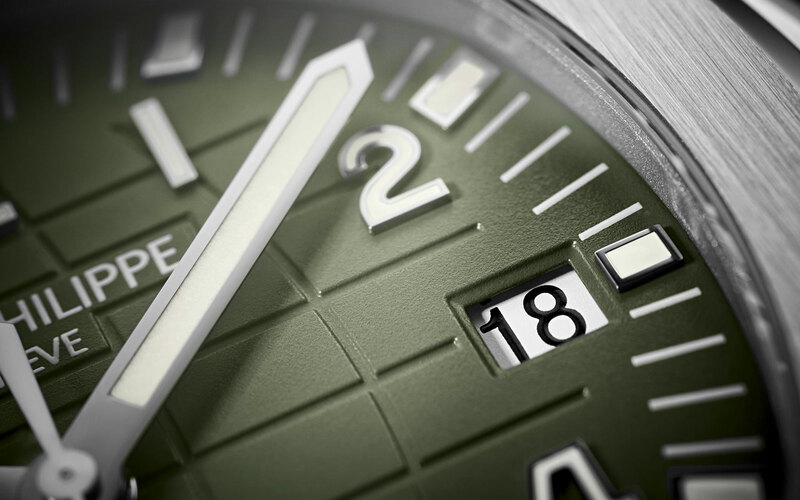 Typical of Moser’s Concept range of watches, the new Venturer is dramatically pared back, rid of all markings and logos, but despite the name, isn’t actually a concept watch; it is regular production. It has a vastly empty dial finished in Vantablack, the blackest of black substances, which absorbs nearly all indecent light. Consequently, three dimensional objects coated in Vantablack appear two dimensional, as their surface shape becomes virtually invisible. And when applied to the slightly convex watch dial, Vantablack creates a deep black void under the crystal. The result is a theatrically minimalist dial with nothing but a pair of red gold leaf-shaped hands floating in nothingness. 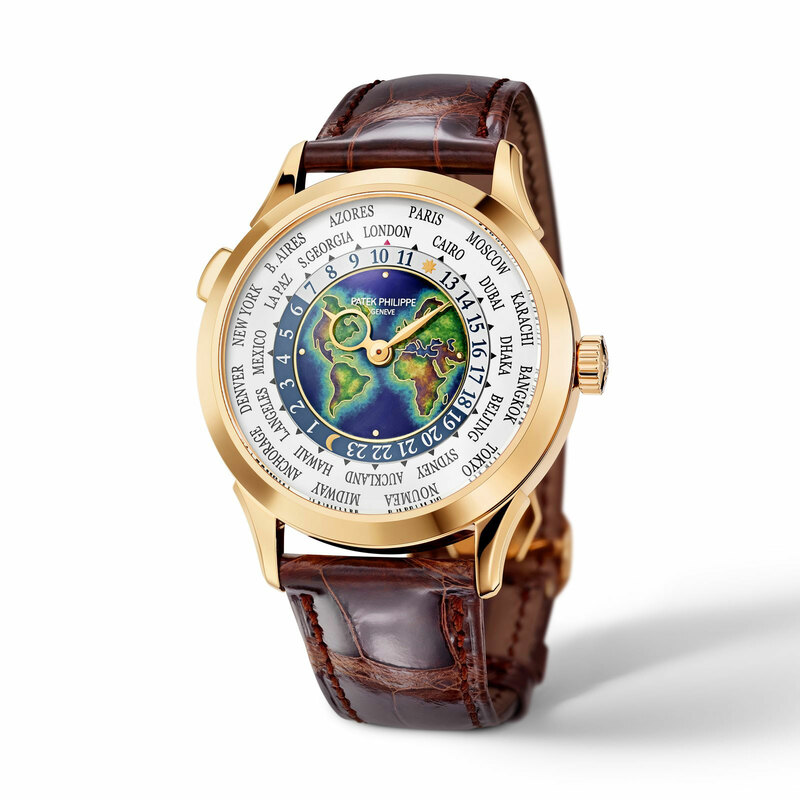 It is paired with a 18k red gold case that measures 39mm in diameter and 11.9 high. 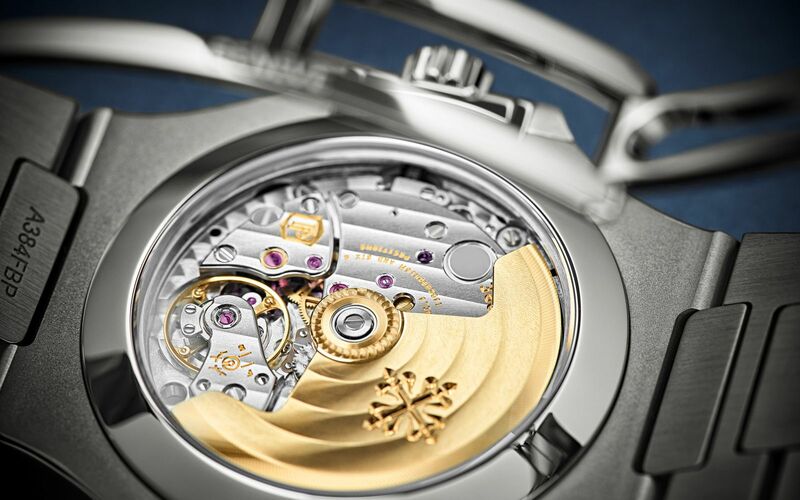 Visible through the sapphire caseback is the HMC 327, a hand-wound calibre with a three-day power reserve. 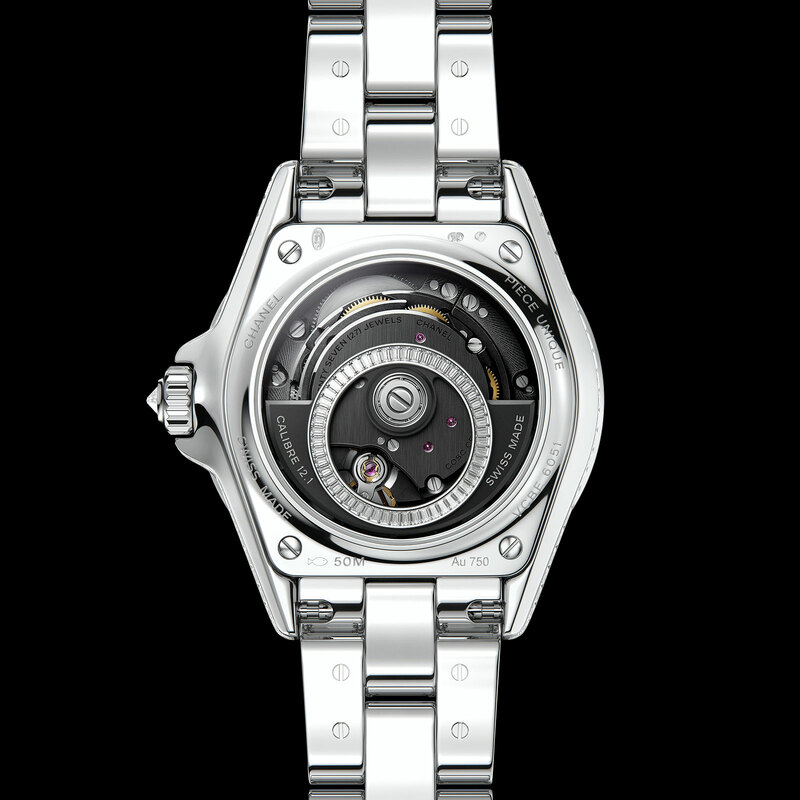 It is equipped with a Straumann hairspring produced by Moser’s sister company, Precision Engineering. 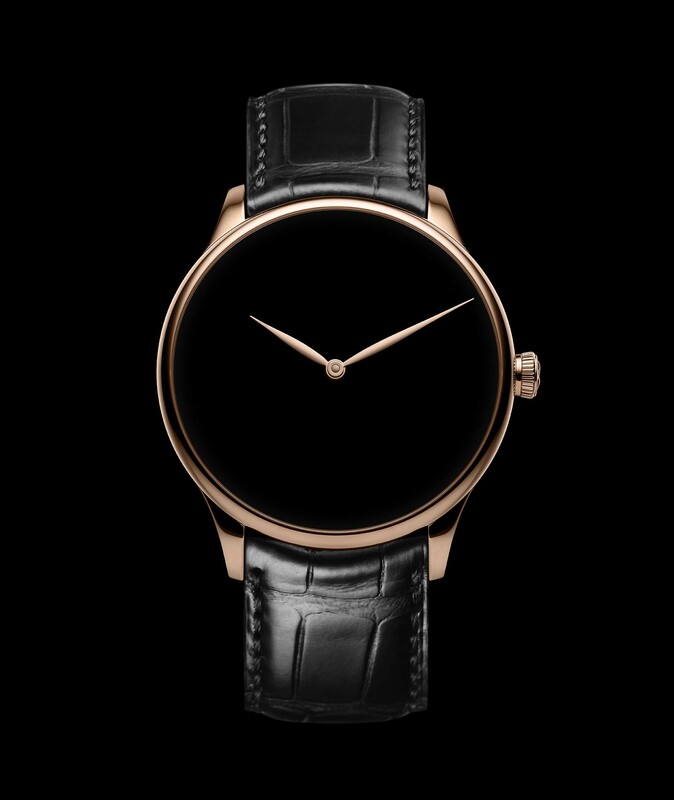 The H. Moser & Cie. Venturer Concept Vantablack (ref. 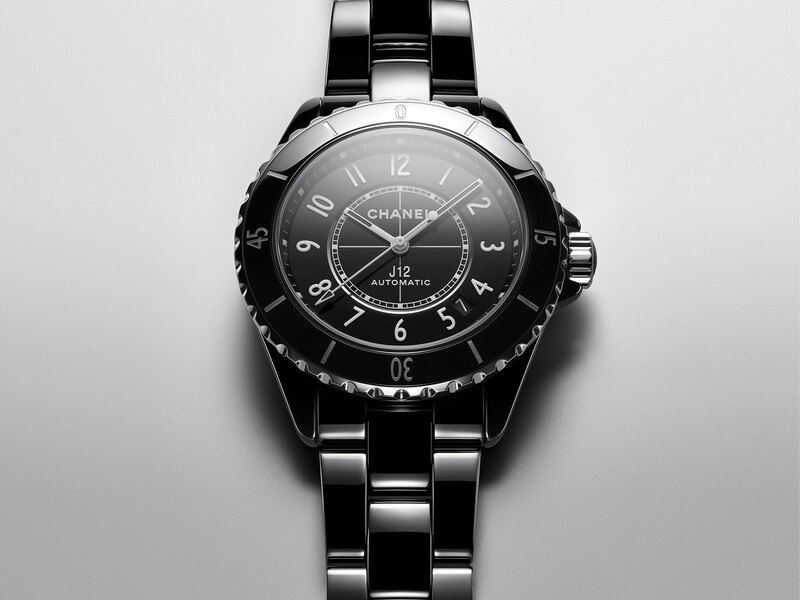 2327-0410) is priced at 25,000 Swiss francs, or 38,790 Singapore dollars. 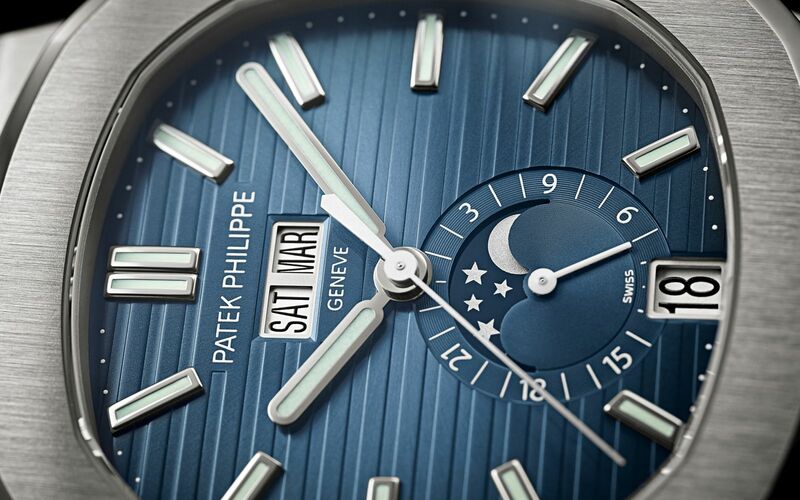 Perhaps the most unusual dial ever made by the watchmaker in a striking, graduated pale blue. Moser minimalism made more complicated. 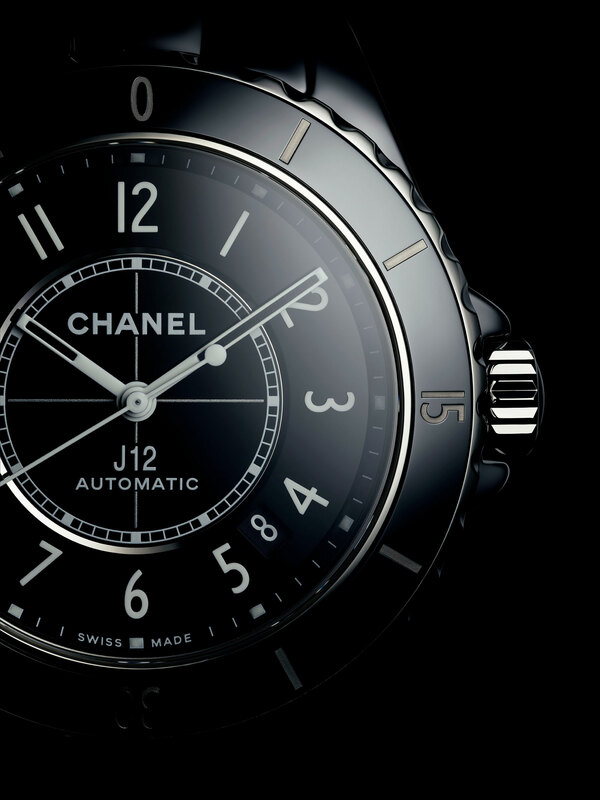 One of the rare handful of modern watch designs that has become an icon and a runaway bestseller, the Chanel J12 marks its 20th anniversary with a revamp that is both subtle and substantial. 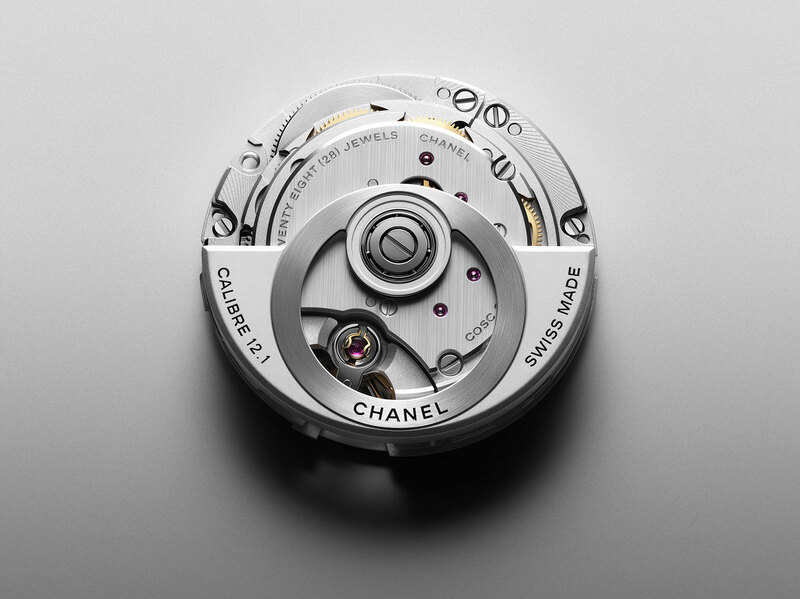 Its styling has undergone a discreet nip and tuck, while the movement is brand new and “manufacture”, coming from the movement maker in which Chanel recently acquired a stake. 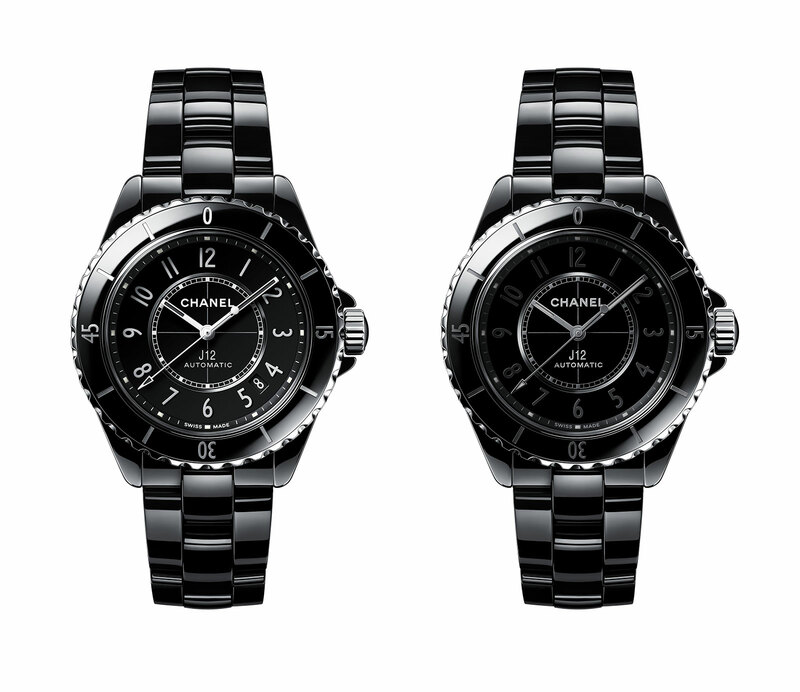 The redesign was led by Arnaud Chastaingt, director of the Chanel Watch Creation Studio, and primarily centred on the dial. 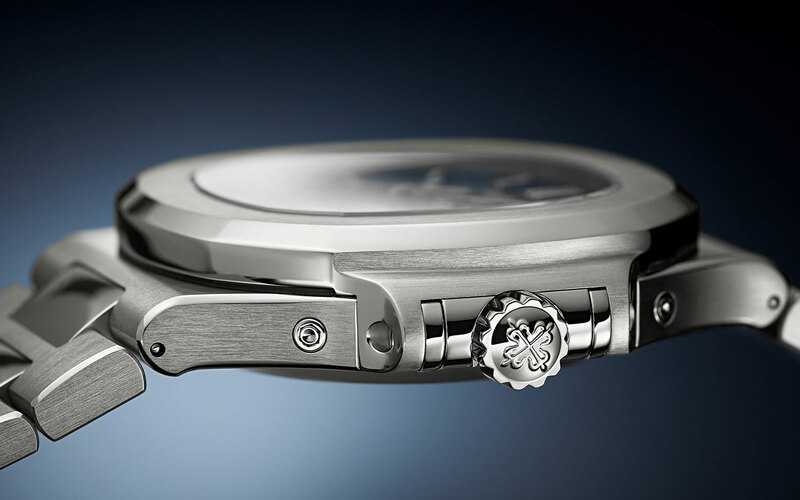 Though the case size remains unchanged at 38mm, the case is slightly thicker to accommodate the new movement. Crucially, the case is now entirely ceramic, instead of built with a steel case back. And to match the new case, the links of the bracelet are slightly longer. The dial opening was enlarged, giving it a larger face. In a nod towards functionality, the typeface used for the numerals has been slimmed down, and the inner railway track has been made more prominent. And on the versions with applied markers, the hour numerals are now in ceramic. 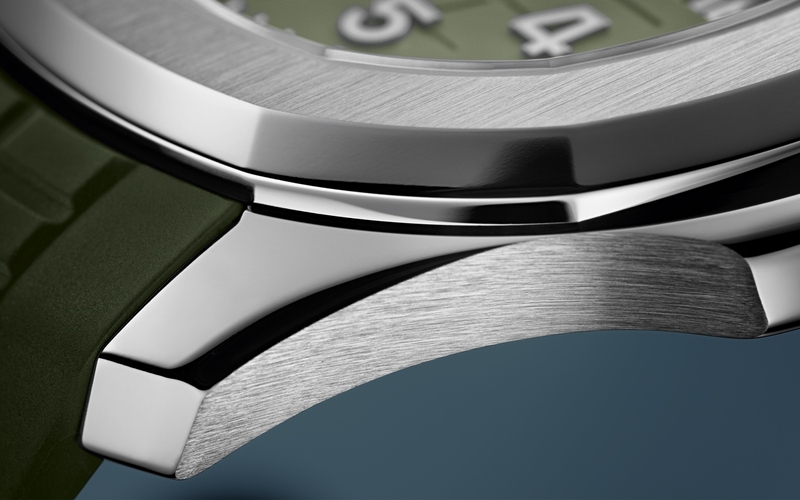 The notches in the bezel edge were increased from 30 to 40, while the height of the crown was cut by a third, both intended to give the J12 a more refined air. The movement inside is the cal. 12.1 produced by Kenissi, a movement maker now in Geneva that will inaugurate a massive new production facility in Le Locle in 2021. 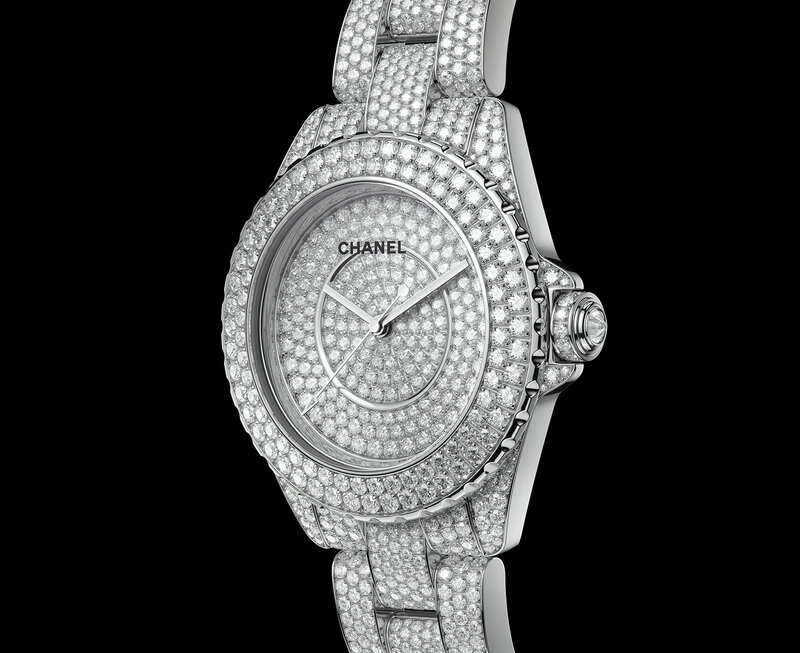 Chanel owns a 20% stake in Kenissi, with the rest being owned by Tudor and a Swiss-French group that produces components for the watch industry. Consequently, the cal. 12.1 is actually derived from Tudor’s MT5600 family of movements. It is COSC-certified, runs at 4Hz and has a 70-hour power reserve. 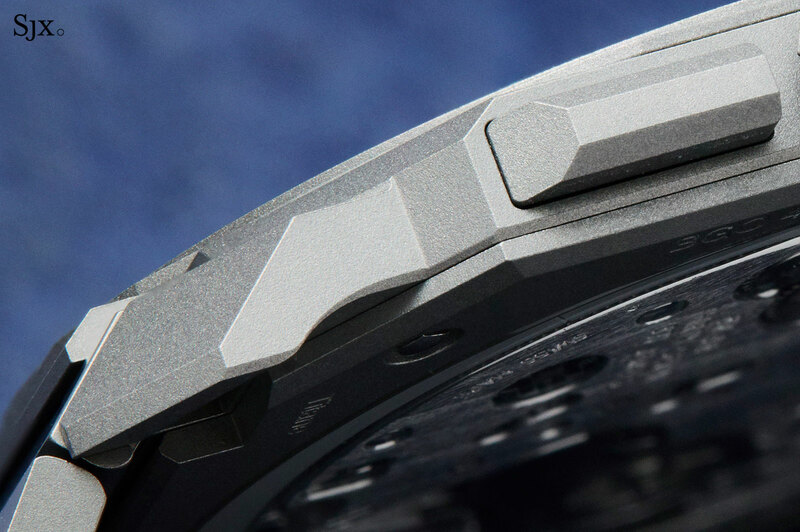 Like the Tudor MT5600 family, the 12.1 has a free-sprung balance secured by a distinctive balance curved bridge. 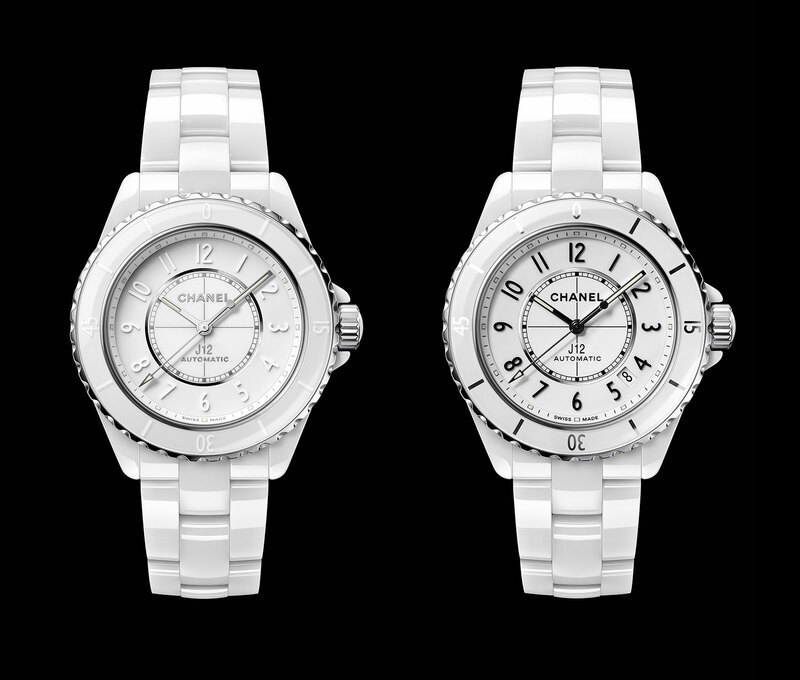 As is tradition, the new J12 is available in black or white ceramic, with a matching bracelet. 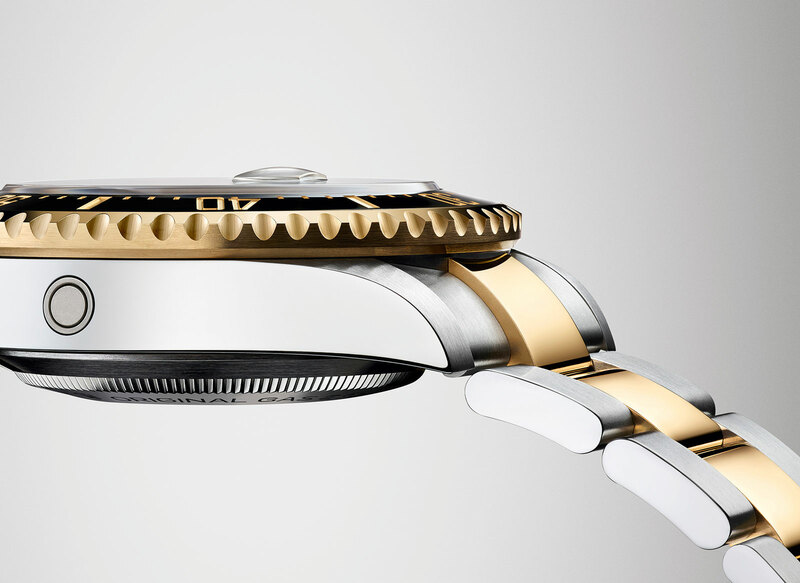 The case is 38mm in diameter, with a screw-down crown and 100m water-resistance rating. 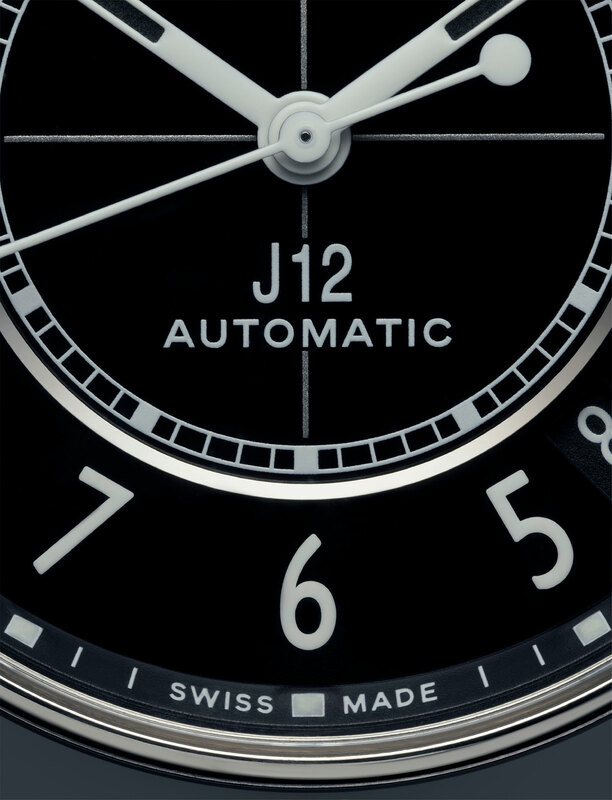 Both models are available with the hour markers and hands in contrast colours, or in tone-on-tone colours to match the case as the J12 Phantom. The J12 is also available in two high jewellery models. The first is a limited edition of 20 watches in 18k white gold, completely set with 19.27 carats of brilliant-cut diamonds, including on the oscillating weight of the movement. And the second is a one-off pièce unique (ref. 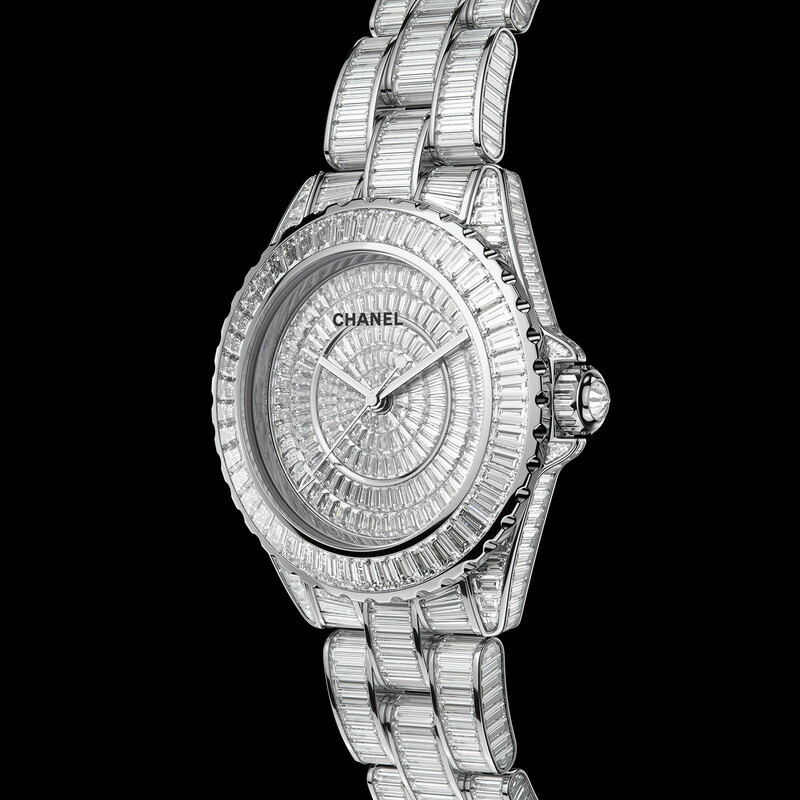 H6051), also in 18k white gold, but set with 44.26 carats of baguette-cut diamonds. Cloisonné dial and Cottier world time. 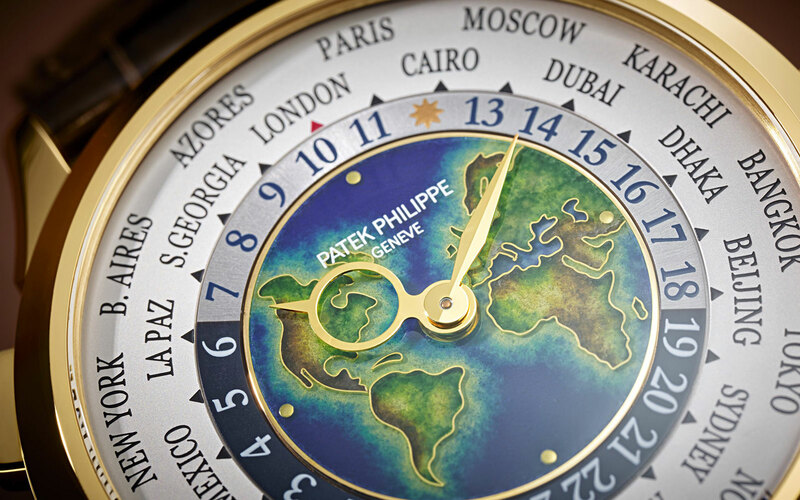 The current generation Patek Philippe world time, the ref. 5230, was launched in 2016 but only now gets the “Rare Handcrafts” treatment of a cloisonné enamel dial, creating the ref. 5231J. Eminently classical in styling and materials, the ref. 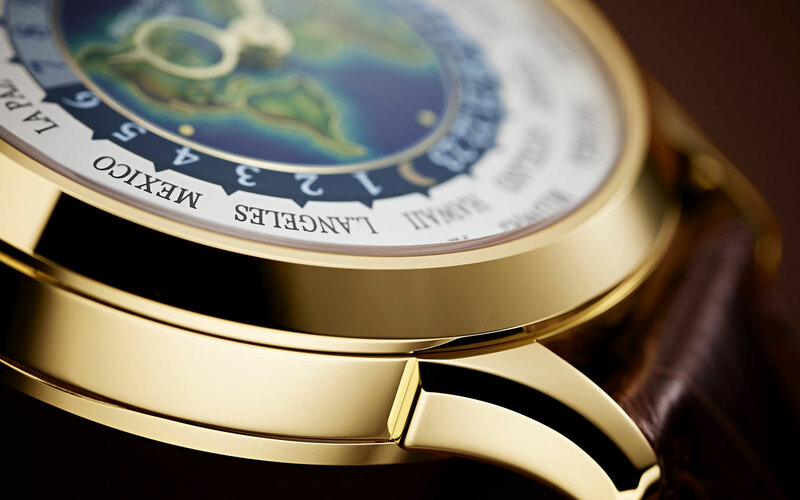 5231J has a yellow gold case and a cloisonné enamel dial that depicts a stylised map of Europe, Africa and the Americas, exactly as it was on its predecessor, the ref. 5131J. The cloisonné dial on the new model does seem to be slightly more detailed than on the ref. 5131J, with a greater nuance of colour and more intricate outlines of the continents. 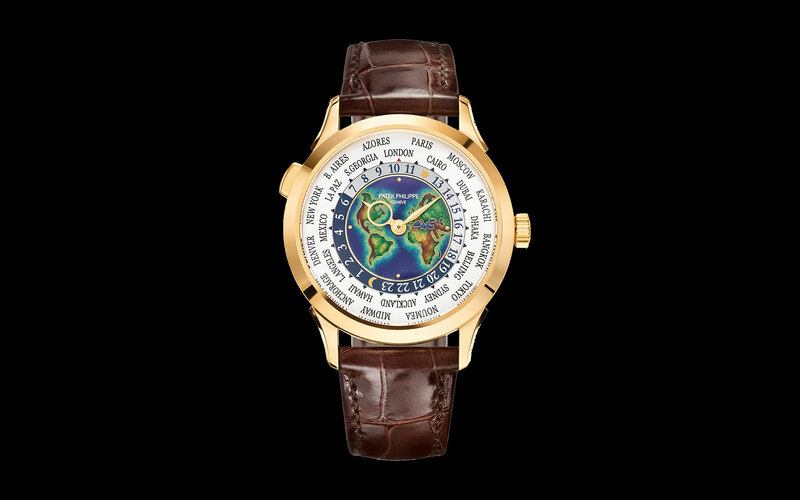 The cloisonne world time has the same case as its ref. 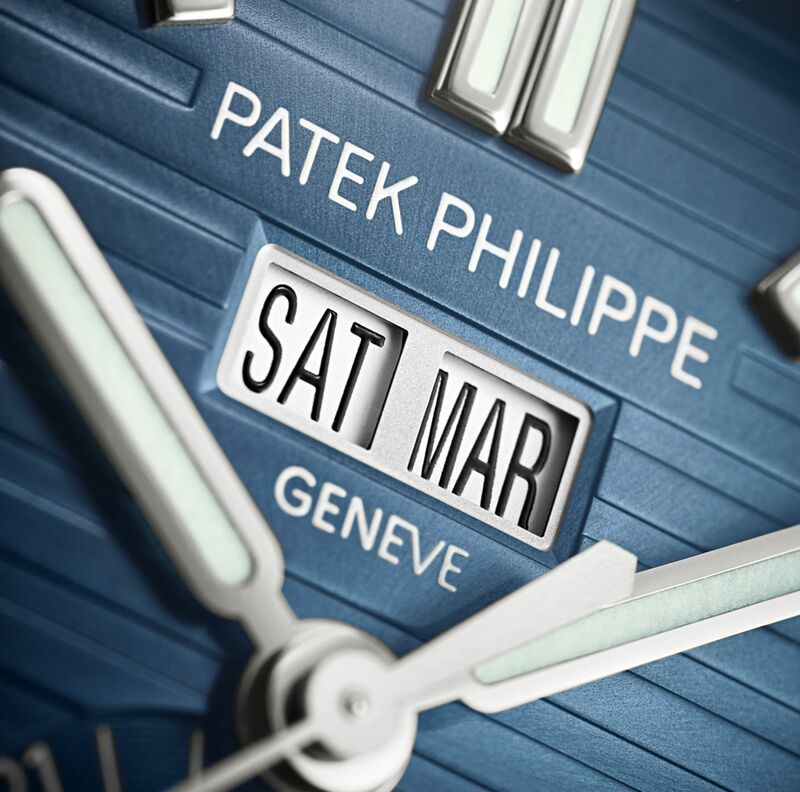 5230 siblings, which means 38.5mm case that’s 10.23mm high and distinguished by “winglet” lugs, a feature drawn from vintage Patek Philippe world time watches of the 1940s, notably the double-crown ref. 2523. It’s powered by the cal. 240 HU, the same movement that’s been in the modern day world time since it was introduced as the ref. 5110 in 2000. The button at 10 o’clock simultaneously advances the hour hand, 24-hour ring and cities disc – the typical function of a Louis Cottier-type world time. The ref. 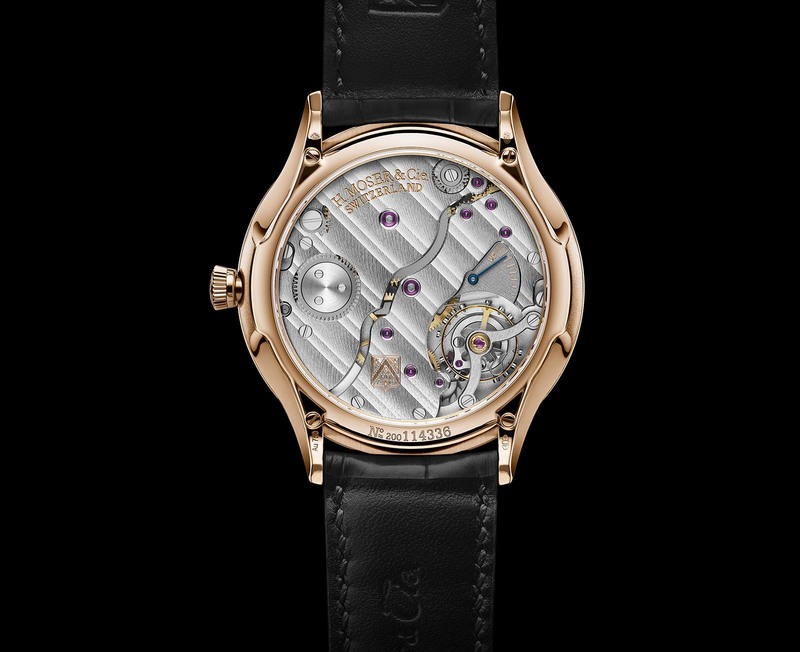 5231J World Time Rare Handcrafts is priced at 65,000 Swiss francs, which is about US$65,000.